The Review on Antimicrobial Resistance (AMR) was commissioned in July 2014 by the UK Prime Minister, who asked economist Jim O’Neill to analyse the global problem of rising drug resistance and propose concrete actions to tackle it internationally. The Review engaged widely with international stakeholders to understand and propose solutions to the problem of drug-resistant infections from an economic and social perspective. The website has a variety of summary documents outlining the scope of the problem throughout the world, as well as recommendations for strategies and technologies that should be adopted to stem the tide of AMR. It is a unique, independent non-profit group involving organisations that represent all stages of the food chain from ‘farm to fork’. This reflects the importance of traceability, transparency and accountability at all stages in the chain: from primary food production, through processing, manufacturing and retailing to the final consumer. Though focused on the situation in the UK, the website still has a variety of relevant resources for Canadians, from position papers, guidelines, and press releases – all surrounding AMU and AMR in livestock species. Created in 2005 ReAct is one of the first international independent networks to articulate the complex nature of antibiotic resistance and its drivers. ReAct was initiated with the goal to be a global catalyst, advocating and stimulating for global engagement on antibiotic resistance by collaborating with a broad range of organisations, individuals and stakeholders. The website has a variety of resources, including a toolbox, a web-based resource that provides guidance on what can be done to address AMR. 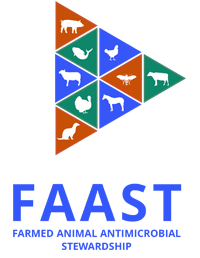 World Organization for Animal Health (OIE) website has a variety of resources on AMR, antimicrobial stewardship standards and principles, multimedia resources (videos, infographics), and OIE activities, with a focus on antimicrobial resistance in animal populations. With a focus on AMR and AMU in agriculture globally, this website has a wealth of information on AMR, projects of the FAO, guidelines for monitoring use, news, and educational resources. Initiative led by the WHO to monitor the implementation of the global action plan on AMR. The website outlines the specifics on the initiative, as well as a report on AMR in participating jurisdictions. CARSS is a pan-Canadian, multi-stakeholder system for surveillance of AMR and AMU. The report integrates data from the Public Health Agency of Canada (PHAC) surveillance systems and laboratory reference services, covering both human and food-producing animal populations. This link outlines Canada’s plan to stem the tide of antimicrobial resistance. Due to the complexity of the AMR issue the Framework was developed with input from federal, provincial and territorial (F/P/T) governments, academics, non-governmental organizations, industry and subject matter experts representing human health, animal health and agriculture sectors at all levels. The Canadian Association of Veterinary Medicine’s website has a wealth of information on AMR and AMU within the Canadian context. Specifically, through collaboration with industry, government, and provincial veterinary regulatory bodies, CVMA has developed a guidance document for the veterinary profession on oversight of antimicrobial prescription and dispensing in Canada. As well, you will find a variety of resources on antimicrobial stewardship and regulatory changes that will affect veterinary medicine in Canada. Health Canada’s website includes educational resources on background, surveillance, research, and government initiatives surrounding AMR and AMU in humans and animals. The Animal Nutrition Association of Canada have developed a number of fact sheet resources describing how the new regulatory changes related to antimicrobial use and access will impact the sale and distribution of prescription medicated feed. The College has prepared a number of resources for veterinarians detailing the Ontario-specific position on establishing and maintaining a veterinarian-client-patient relationship, and their broader role in antimicrobial stewardship. The Ontario government have provided a number of webpages that explain their role in antimicrobial resistance, and how veterinarians and animal owners can play their part in antimicrobial stewardship.